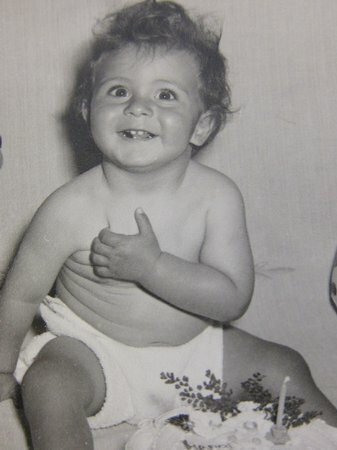 ...that smiling baby was John Suchet, our weekday morning presenter. This, John assures us (and he's still smiling), is a picture of him on his twenty-first birthday! This wheely great young tyke will go on to become a big part of Classic FM's weekends. You can hear the pedal-powered Tim Lihoreau on weekend mornings between 6am and 9am. We're told this baby was an early riser... great practice for his slot on Classic FM. And you can catch the ever-youthful Mark Forrest at weekday mornings between 6am and 9am. Snapped smiling with her Dad at the beach, this is another youngster that would go on to become an essential part of Classic FM's weekend. Still smiling, you can catch Anne-Marie on Saturday between 3pm and 6pm, and between 5pm and 8pm on Sunday. This cute baby is happiest in the sun... or radio studios with broken air conditioning. You can catch Nick broadcasting from a sweltering radio studio between midnight and 6am on Monday, or 2am and 6am on Tuesday, Wednesday and Thursday.